KOTA KINABALU: State Tourism, Culture and Environment Minister Datuk Masidi Manjun today emphasised the importance of planting trees on hillslopes in an effort to reduce the occurrence of natural disasters especially landslides. 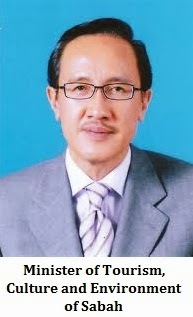 He said this approach should be implemented to create a balance between economic development through agricultural activities and the natural ecosystem in high altitude areas especially in Kundasang which is located at the foothills of Mount Kinabalu, which is among the highest mountains in Southeast Asia. He said the planting of trees in vegetable and fruit farms on the hillslopes could strengthen the soil condition and structure, thus speeding up the process of water absorption and reducing the risk of erosion. “That is why the planting of trees in hillslope areas in Kundasang is most encouraged,” he told reporters when met at the breaking of the fast with the staff of Kota Kinabalu City Hall (DBKK), here last night. In the incident at about 10.45am, strawberry vendor Dohumie Kinte, in her 70′s, was believed to be picking strawberry alone in her farm when the incident struck. Her body was found at 12.15pm yesterday under the debris of the landslide at her farm. Masidi said the unexpected incident should give a lesson on the importance of conserving the environment in preventing destruction to property and the loss of life in future. At the function, the minister gave out DBKK contributions to 10 mosques around the state capital and raya contributions to 20 personnel of DBKK to celebrate the Hari Raya.